Hydrangeas simply exude understated elegance, bringing real class to summer borders. Their eye-catching flowers and colourful autumn foliage make them really useful specimen shrubs that will provide a long season of interest. 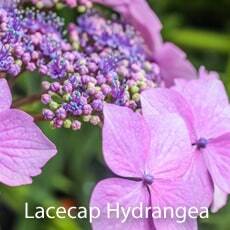 Take a look at our hydrangea plants for sale online to find one that will suit your garden. Hydrangeas come in all shapes and sizes! Many grow to become attractive, medium sized shrubs that look stunning in borders, but some are compact enough to be grown in a container, while others form magnificent climbers. Here are some that you will often find available. 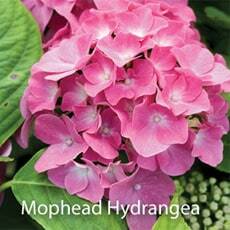 Mophead and Lacecap Hydrangeas are some of the best known. Mopheads (or Hortensia Hydrangeas as they are sometime known) such as Hydrangea 'King George' have large, rounded flower heads made up of mainly sterile flowers. Lacecaps are distinctly different, with more flattened flower heads that have a cluster of small fertile flowers at the centre which are surrounded by an outer ring of showy, large, sterile blooms. These Hydrangeas are all cultivars of Hydrangea macrophylla and are particularly well known for their ability to change colour depending on the acidity of the soil. Some of the recent introductions , such as Hydrangea 'Glam Rock' have particularly bold flower colours with a modern, contemporary appearance. 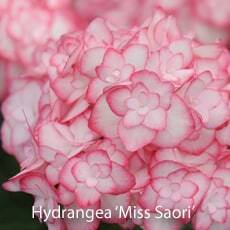 For something really magical in your garden, why not try Hydrangea 'Miss Saori' . This stunning double flowered Hydrangea was crowned the Chelsea Flower Show Plant of the Year 2014. Perfect for: A fabulous display in a large patio container. Hydrangea arborescens is one of the most magnificent species. 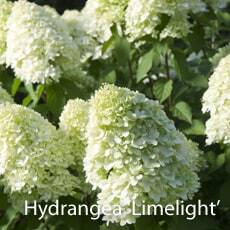 Hydrangea 'Annabelle' is possibly the best known, or why not try H. arborescens 'Incrediball' . Rounded blooms of up 30cm (12") diameter open from midsummer to autumn in a breathtaking display. These large shrubs are particularly hardy, positively thriving in those difficult cold, shaded north facing spots. The enormous blooms are always a favourite for flower arrangements but can make this species harder to place in the flower border among other plants. Far better to give it the space it needs and grow it as a large and showy specimen shrub! Perfect for: A large showy specimen for a cold, north facing spot. 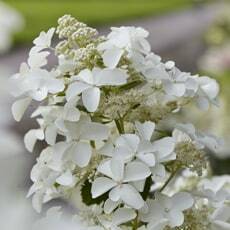 Hydrangea paniculata cultivars such as Hydrangea 'Limelight' have upright panicles of beautiful white, cone shaped flowers, often flushed with pink or changing colour throughout the season as the blooms mature. These elegant, quick growing Hydrangeas form medium sized or even large shrubs if given the space. The newly opened flowers that appear from late summer to autumn have a fresh springtime appearance that's ideal for lighting up a gloomy spot in the dappled shade of deciduous trees. Perfect for: An elegant display in shady woodland areas. Hydrangea anomola ssp.petiolaris is the best know of the climbing Hydrangeas. Despite its lengthy name, this deciduous climbing hydrangea is a popular choice for a cold, north facing position where most climbers would struggle. Thriving in the most inhospitable garden conditions, it uses its aerial roots to cling to walls and fences, clothing them in heart shaped foliage that makes a beautiful backdrop for its lacy blooms. Climbing Hydrangea petiolaris blooms from late spring to early summer. If you are looking for year round interest then an evergreen climbing Hydrangea such as Hydrangea seemanii makes a great choice, although it is not as hardy as its deciduous cousin and will require some winter protection. Perfect for: Climbing north facing walls and fences. Hydrangeas prefer a sunny or semi shaded position, in a cool area of the garden with shelter from cold, drying winds. For this reason they are especially useful for brightening up shaded borders and make a lovely feature in the dappled shade of woodland gardens. Try to avoid hot, sunny areas and east facing spots where colds winds can damage the spring growth. 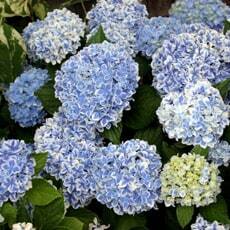 Grow hydrangea plants in any rich fertile, moist soil. It's a good idea to work in some well rotted manure or compost prior to planting Hydrangeas, and they will always appreciate a mulch of organic matter in spring to help conserve moisture at their roots and feed them up for them for the coming growing season. 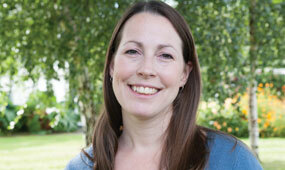 On light soils, it is a good idea to feed Hydrangeas with an ericaceous fertiliser . Hydrangea macrophylla cultivars are well known for their ability to change flower colour depending on the levels of available aluminium in the soil. These levels are affected by soil pH, so on acid soils where the pH is 5.5 or less and aluminium is freely available then the flowers take on a lovely shade of blue. On soils with a higher pH, there is less aluminium available and the blooms will consequently be pink. White Hydrangeas are the exception however, as these are unaffected by soil pH. On soils that have a fairly neutral pH it is possible to bring this change about by applying a blueing agent that contains aluminium sulphate to the soil. 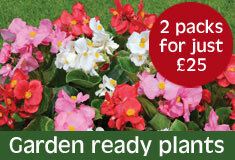 These can be found online and in most garden centres. It is possible to achieve the same effect by growing Hydrangeas in pots of ericaceous compost. Shrubby Hydrangeas such as Hydrangea macrophylla cultivars, H. paniculata and H. arborescens can all be treated in a similar way. Flowering on the previous year's wood, they generally need little maintenance, but pruning will certainly help to produce a better display. Prune Hydrangeas after flowering, reducing the stems to restrict their growth to the available space and to improve the shape of the plant. In cold areas leave the faded hydrangea flower heads in place until the new buds swell in spring. This helps to protect the delicate buds from frost damage. If necessary, neglected Hydrangea plants will tolerate hard pruning to form a low framework of stems in spring, however this will mean sacrificing the majority of the flowers for that year. Climbing Hydrangeas will require a little training in the early years to encourage their stems to cling to walls and fences. Tie them in to their supports until they are firmly attached - this may take several seasons. Prune climbing Hydrangeas immediately after flowering by removing the faded flower heads and shortening the stems to fit the available space.